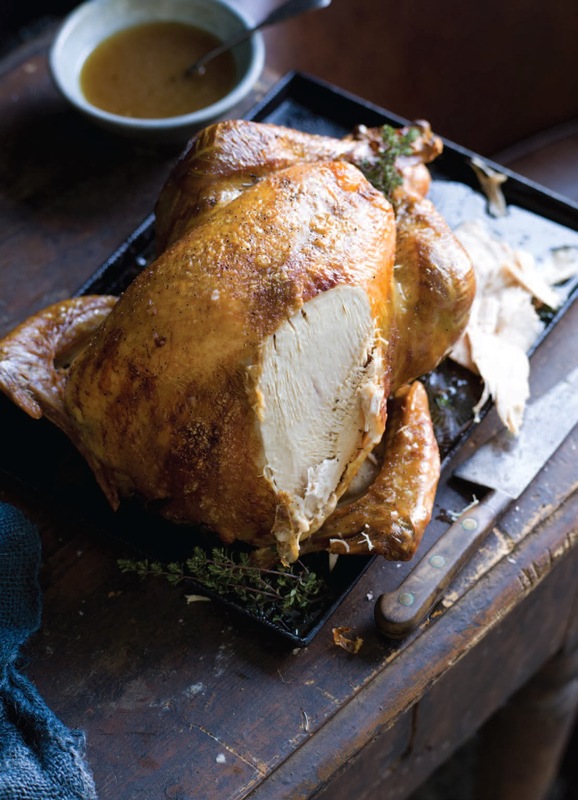 I thought the recipe for Holiday Turkey on page 29 of Cooking Slow was complete perfection, until I was asked to slow roast a 20-pounder for a turkey promotion at our local co-op. Of course, I didn't follow my original recipe exactly (I am incapable of precise reproduction) and, damn, if it wasn't improved. Don't get me wrong. 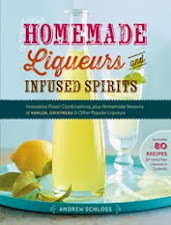 The recipe in the book is perfectly fine and almost effortless. I was just intimidated when I wrote it and now I've grown braver, or maybe I've become an even bigger fool than I was a year ago. Take your choice. 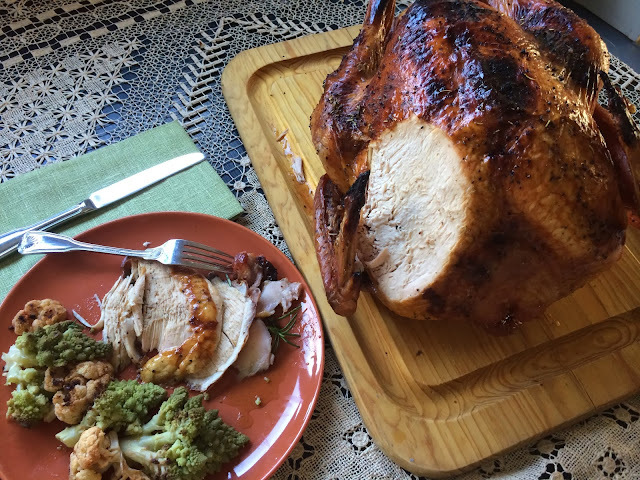 When I originally published the recipe I was worried that your oven would not be quite up to temp, so I hedged my bets by recommending that you roast at 175°F even though turkey meat is done at 170°F. I just wasn't ready to be deluged with letters blaming me for shocking pink thigh meat. Well, after consuming more than my share of this slow roasted wonder, I can report that roasting at 170°F yields thorough cooking and incredibly succulent and moist meat throughout the bird with hardly any work on your part. 36 to 48 hours ahead - Season the turkey, inside and out with salt and pepper, and set on a rack in a roasting pan in the refrigerator, uncovered, for 12 to 24 hours. It is important to keep the turkey uncovered to allow the skin to dry which will ensure that it crisps well during roasting. Don't worry it won't make your refrigerator smell like turkey, nor your turkey like your refrigerator. 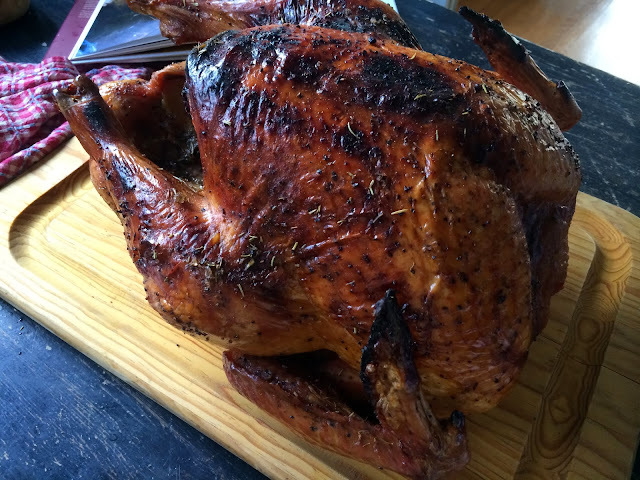 15 to 25 hours ahead (depending on the weight of the turkey) - Remove the turkey (still on its rack, in its pan) from the refrigerator, drizzle it with oil, and roast at 450°F for 45 minutes to 1 hour. The skin will be burnished golden brown and any harmful bacteria that was occupying the surface will be eliminated. It is now safe to turn the temperature down and start slow roasting for real. 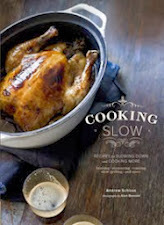 14 to 24 hours ahead (depending on the size of your turkey) - Pour a quart of good quality apple cider over the turkey, and season the liquid in the pan with a few big pinched of high class poultry seasoning (I, of course, use Chef Salt Truffle Herb, a redolent mix of truffle salt, pinot fleur de sel, Halen Mon Gold flake salt, porcini powder, and herbs). 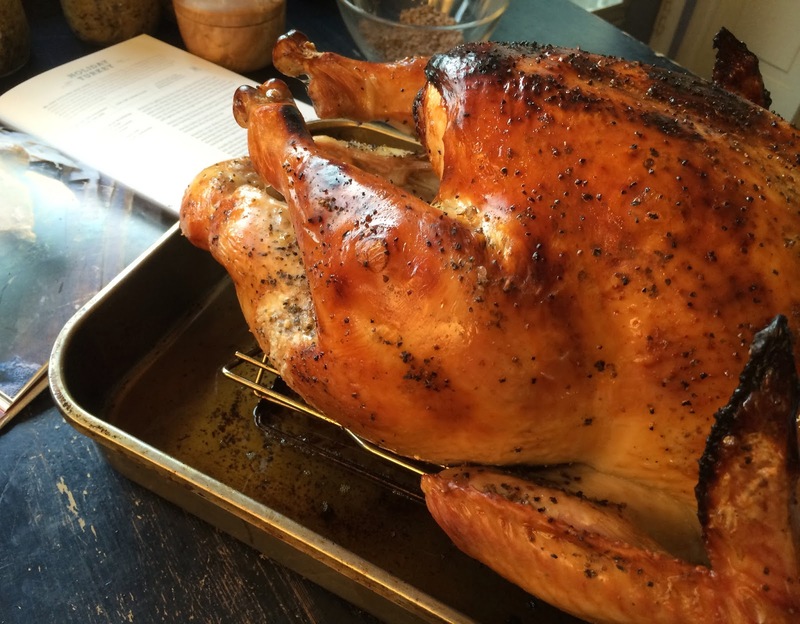 Reduce the oven temperature to 170°F and roast your turkey for at least 1 hour per pound. 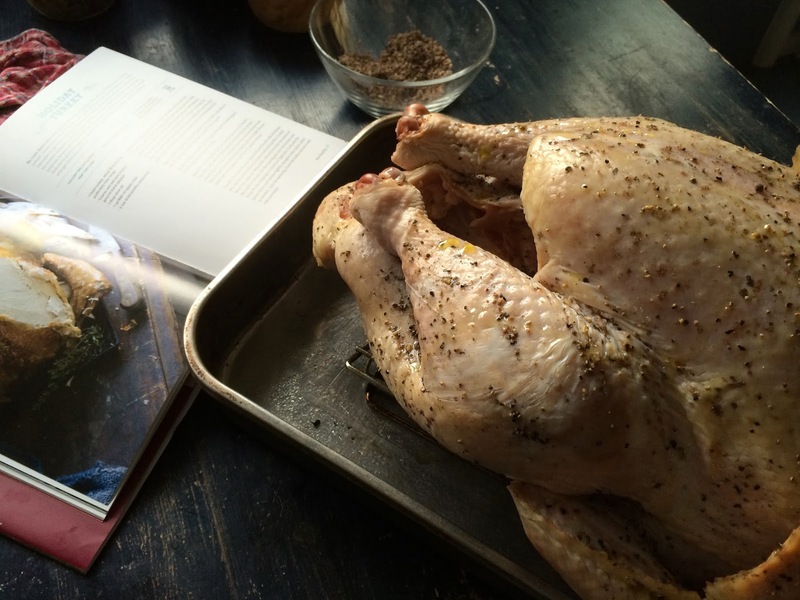 Because the oven temperature is no hotter than you want the bird to be at perfect doneness it can not overcook. The 1 hour per pound guideline is to ensure that the entire bird gets heated through, but roasting longer will not be a problem. Remove the turkey to a carving board. Skim the fat from the surface of the pan juices. Carve the turkey (no need for resting) and serve with its apple cider jus. Which of your salts to season with? 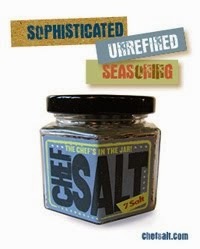 I would use Chef Salt Truffle Herb or Tuscan Herb. But if you want to go exotic, try Tunisian Fire -Delicious on poultry. Is that apple cider juice or vinegar? Apple cider juice; as fresh as you can get. i'm confused on your timeline. . .do you bake at 450 for 45mins to an hour, then take out and add the apple cider , then turn down to 170 for duration of cooking?? Exactly, but no need to take the turkey out of the oven. Just turn down the temperature, pour the cider into the pan, and close the oven. At what point does this turkey become pulled pork? I would think that would never happen. 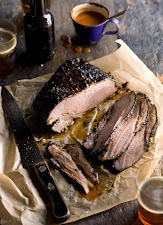 Pulled pork falls apart because the cooking temperature is hot enough to melt the connective tissue so that the meat falls apart. that won't happen to poultry at 170 degrees. If you bake the turkey one day ahead and store in the refrigerator, at what temperature and for how long do you reheat the bird before serving? In slow roasting its best to serve the meat right from the oven. Because the cooking is so slow there is no time benefit in precooking it, chilling it, and rewarming it. It would take several hours at least at 170 to bring it from refrigerator temperature back to 170 so you might as well just leave it in the oven until you are ready to serve it. Leftovers can be rewarmed in a low oven (250 degrees or so) or briefly in the microwave. Please help. My husband and I are arguing whether to bring a turkey to room temperature before putting it in the oven for your slow roast method. Since you do not mention this please advise - what do we do? Thank you for your reply. 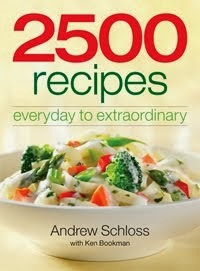 Andrew, I have a great big pork loin roast. 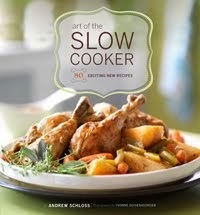 Can I cook that the same way you slow cook a turkey breast from page 30? Maybe brown it first? 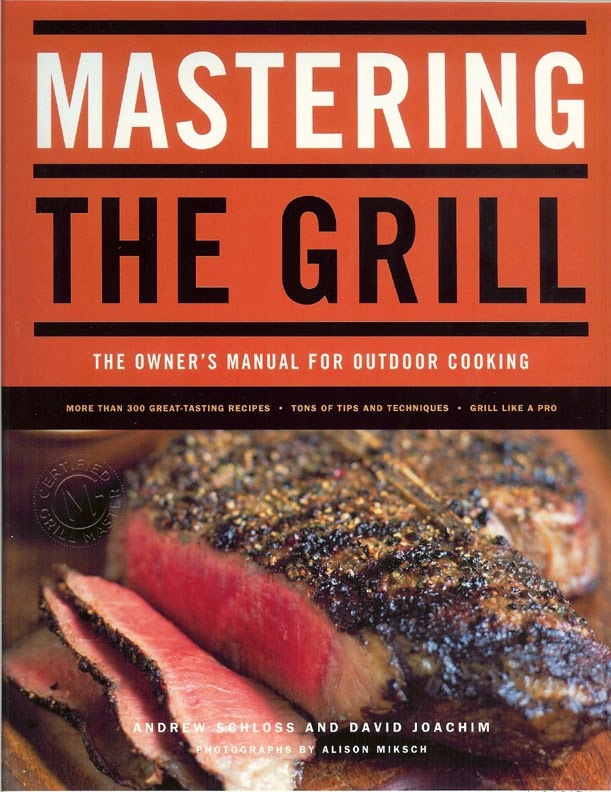 I have your cookbook Slow Cooking and have tried some of the recipes, the most recent was from p 36 the Fork Tender Beef Chuck. Well wouldn't you know it the butcher didn't have the chuck so I bought a pork shoulder instead. At 6 hours the meat wasn't brown enough looking and my guest was hungry so I cranked the heat up to 350 for one hour. That was the best pork I've ever had, well done but tender and moist. She thought it would be like pulled pork after all those hours but no, it sliced like a dream.